Working overnight last Friday, road crews painted about 490 feet of a newly paved, 124-mile stretch of the road with the strips. Ms. Poepjes said music from “a popular part” of the regional anthem, “De Alde Friezen,” or “The Old Frisians,” from the 19th century, had been painted on. The project cost 80,000 euros, or about $ 77,000. When drivers hit 60 kilometers per hour, about 38 m.p.h., the regional anthem rang loudly and clearly. And if drivers wandered onto the shoulder at a lower speed? “You’d get the same thing if you play a Madonna record backward,” she said, laughing. But soon, villagers began complaining that they could not sleep. Ms. Poepjes said residents had complained that a lot of drivers were deliberately veering onto the shoulder to start the anthem. “Enthusiastic young people were driving way too fast,” she said. So, less than two days after the strips were laid down, province officials had them scraped off overnight Wednesday. The Jelsum experiment is not the first of its type in the Netherlands. In 2014, the city of Oss installed glow-in-the-dark, “smart” highway lanes. 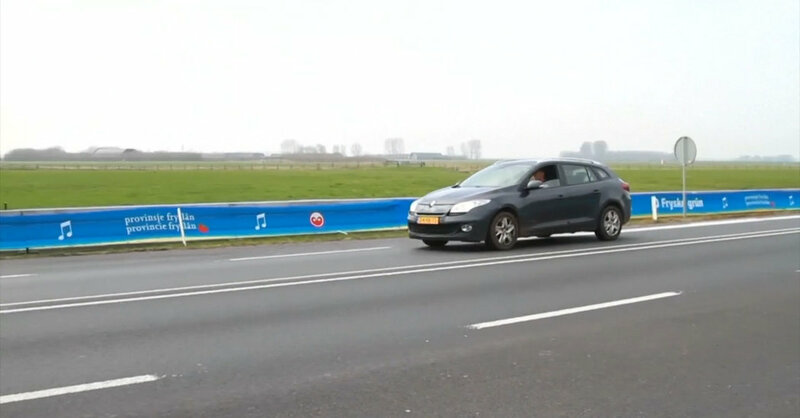 And the Netherlands isn’t the first country to make roads “sing” in an attempt to improve safety. Denmark, Japan, South Korea and the United States also have musical roads. In Albuquerque, N.M., a section of Route 66 rumbles “America the Beautiful.” In Japan, rumble strips near Mount Fuji can be brought to life in a similar way. In Lancaster, Calif., however, a stretch of desert highway is woefully out of tune. It is supposed to play the “William Tell Overture” from Rossini’s opera when drivers hit 55 m.p.h. The grooves in the road, however, were not installed at the right distance from each other, distorting the sound. As for the Dutch experiment, Ms. Poepjes said officials had not totally given up.